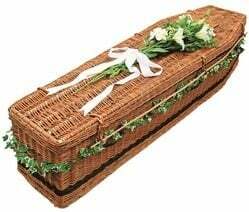 We have a range of Coffins to suit every budget. Our full catalogue is available on request. coffins with veneered matching moulds. Manufactured from recycled cardboard, the cardboard coffin provides a simple less expensive alternative to all other coffins on the market. biodegradable, natural, chestnut willow coffins in a traditional style. With base and lining. Flowers not included.